Creepers abound in Birchtown. So do mysteries! Like, who destroyed the village garden? What’s that strange music coming from the cobblestone well? And who—or what—keeps blowing up the blacksmith shop? Oliver and Audrey investigate in 5-Minute Mysteries for Minecrafters, an all-new series of stories for Minecrafters that can be read in five minutes! In The Creeper Code, the very first book in this mystery series, Oliver and Audrey learn there’s a reward for tracking creepers and cracking cases. From secrets in the swamp to bungles in the jungle, there are mysterious happenings in every block of the biome. But with Oliver’s eye for detail, Audrey’s courage, and their wolf-dog’s super-sniffing nose, no case is too tough for these twins to crack. Follow twins Oliver and Audrey as they solve mini mysteries in Birchtown—and all around the Overworld in The Creeper Code. In between mini mysteries are coded messages for you to decipher. You can solve each mystery, too—by searching for clues hidden in the stories and illustrations! 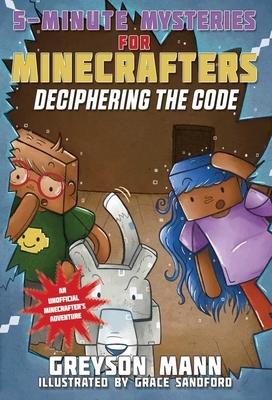 Help decipher messages written in the “creeper code.” Hunt for clues and try to solve each mystery before Audrey and Oliver do! Grace Sandford is an illustrator and designer whose clients include Palmer Hargreaves, Stew magazine, Green Android Ltd., and Paper and Apparel. Her books include the two previous books in the Secrets of an Overworld Survivor series; Tough Cookie, written by Kate Louise; and The Egg, which she both wrote and illustrated. She currently resides in Norwich, England.